The first San Antonio car dealership was a bike, photo and typewriter repair shop that started selling 1902 Curved Dash Oldsmobiles. It’s amazing to see today’s rush of technologies, ragged edges and all, bump and grind in the marketplace in a race to reconfigure how we work and play. But the dizzying pace really isn’t all that new. Consider the shock of the first horseless carriages rumbling over rutted streets more than a century ago, stirring up dust, dropping jaws and spooking horses. Giving us a glimpse into those strange and heady times is “San Antonio on Wheels,” a book written by fellow OnTheMoveBlog.com blogger Hugh Hemphill. Just as tech ventures come and go in a slippery market – producing epic battles among giants such as Netscape and Explorer, Google and Bing, iPhone and BlackBerry – so too did early auto experiments. 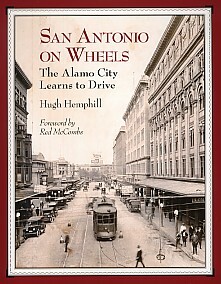 The first horseless carriage in San Antonio probably wasn’t even gasoline-powered, Hugh wrote in his book. It was likely an electric vehicle built for Montgomery Ward, which toured Texas in 1897. Hugh says electric cars were limited by their short range and long recharging. (Sound familiar?) But they were much easier to start than hand-cranked gasoline competitors. 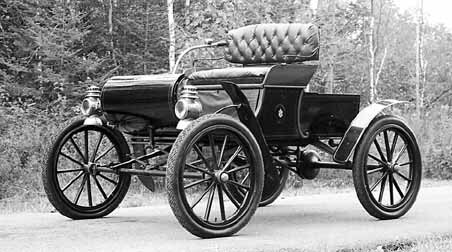 Ironically, another electric motor, the electric starter for combustion engines, swiftly booted electric cars out of the market after 1911. Steam cars also gave their gas cousins a run for their money, especially in the early days when highly flammable petrol was sold in buckets and hand filtered through a chamois, Hugh wrote. The first steamer to actually hit the streets in San Antonio was a Locomobile in 1902. Texas oil discoveries, dropping gas prices and gradual development of a network of filling stations slowly choked off the heavy steamers with their water tanks and boilers, though they lingered until the 1920s. Meanwhile, the first gas-powered carriage, a Haynes-Apperson, arrived in San Antonio in 1901. Not long after, Hugh wrote, some citizens petitioned City Hall to ban the dangerous contraptions, but to no avail. The city’s first auto agency was a bicycle, Kodak and typewriter repair shop that added the Curved Dash Oldsmobile to their line in 1902. The shop’s first car, a $650, one-cylinder, wooden-wheeled affair, was sent by train and horse-drawn wagon to the back yard of one of the owners. They assembled the car, drove to a local race track and pushed the vehicle to speeds of 30 mph. That’s not so fast, you probably say. But folks back then thought so. In 1910, the city’s first traffic ordinance set speed limits of 8 mph downtown and 15 mph elsewhere. Like Internet connections, cars got a lot faster. But like the relentless change swirling around us, sometimes they were too fast for comfort. Hugh trekked across the San Antonio region for years, sifting through uncounted documents and photos and pulling together a largely untold story about automobiles coming to San Antonio and changing the city forever. “San Antonio on Wheels” is a richly detailed slice of just some of his many findings.